For Isabella Alden there were few places on earth more dear to her than Chautauqua Institution. She spent many summers there, and was greatly involved in the Chautauqua Literary and Scientific Circle (C.L.S.C.). You can judge just how great an impact Chautauqua had on her by the loving manner in which she described the place in her Chautauqua books, which she wrote in the late 1890s and early 1900s. Chautauqua Institution is still a thriving summer destination for thousands of people. 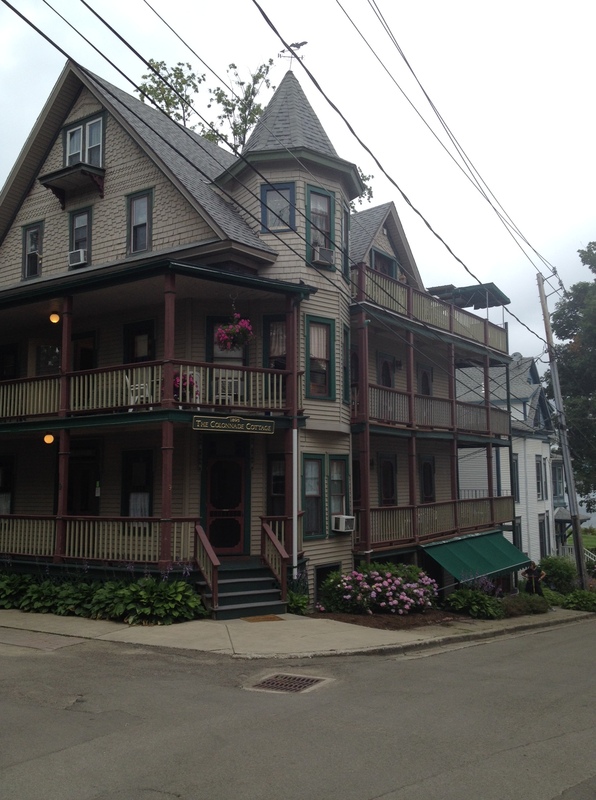 Earlier this month, Karen Noske, a regular reader of this blog, took a trip to Chautauqua. 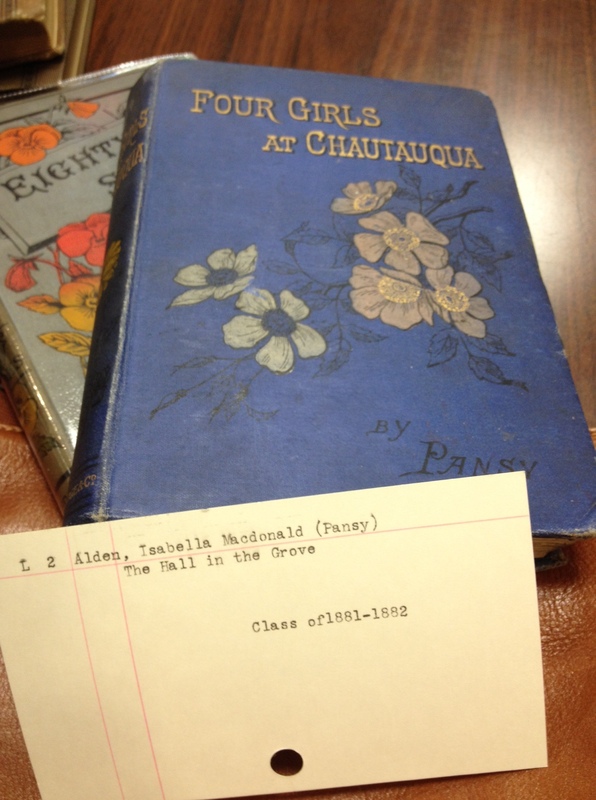 Today she is sharing the highlights of her quest to see for herself the beloved Chautauqua locations Isabella so dearly loved and faithfully described in her books. Like many of Pansy’s fans, I’ve longed to walk the “tree-shaded” avenues of her hallowed Chautauqua, and decided to take the plunge this summer, as I live only about 3 hours east. 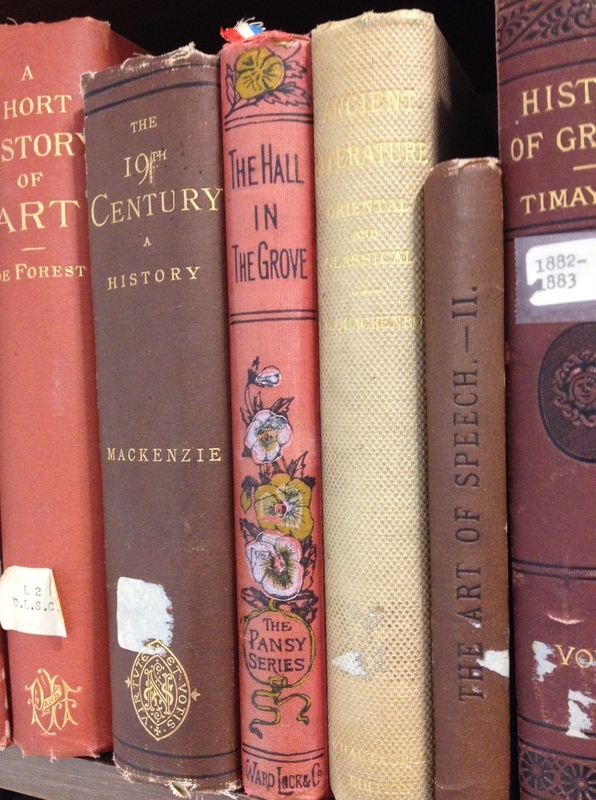 For your enjoyment and education, I offer these guest posts as a sort of “now and then” view of many of the places mentioned in her books Eighty-Seven, The Hall in the Grove, and Four Girls at Chautauqua. I’ve limited my review to those seminal books as they hold some of the richest treasures for modern-day Chautauquans and fans. I should have paid more attention to the carefully worded descriptions of Isabella Alden’s favorite summer retreat, Chautauqua. In her marvelously descriptive and touching books about its lakeside, forested environs, she often mentioned that her characters “went down” to the lake or “went up” to the dining tent or the grove. As I breathlessly labored to keep from running pell-mell down the steep inclines that make up 90% of the avenues here, I realized she’d been remarkably coy about this physical aspect of the grounds. Mountain goats would love this place. After stowing my meager luggage in one of the many charming cottages that cling defiantly to the nearly vertical hillside, I hiked up to my first stop—the Archives, where I hoped to meet Pansy by way of her works. This small brick building houses the full complement of the C.L.S.C. 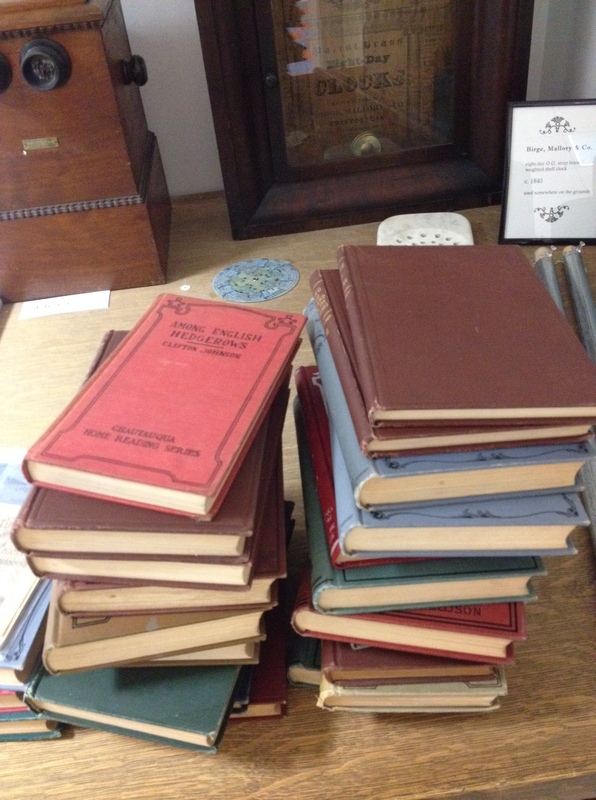 volumes, from the year of this reading circle’s inception (1878) to the present day. Her eyes lighted with pleasure as she recognized it. This, at least, was an old friend: Philosophy of the Plan of Salvation. She did not need to read the letters on the title page to make sure that the book—so like her own—bore that name. “C.L.S.C?” she said, hardly realizing that she said it. 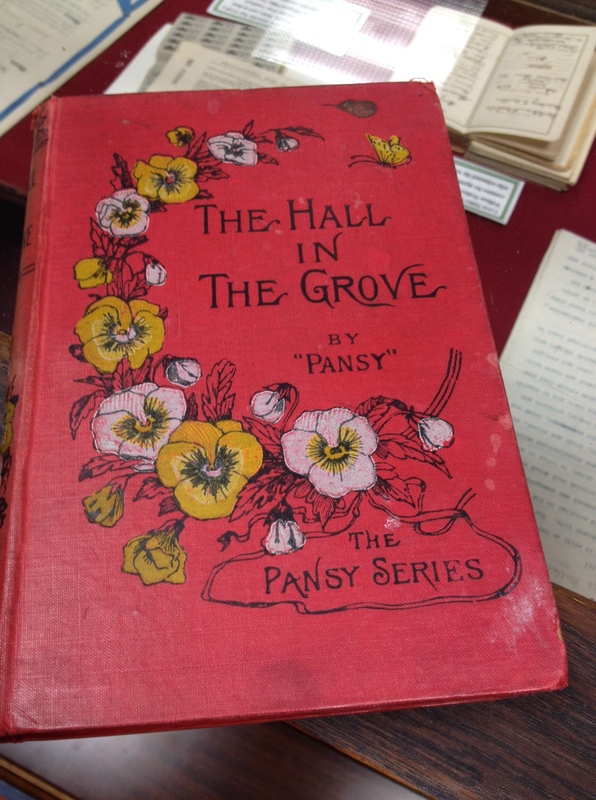 I was delighted to find Pansy’s The Hall in the Grove (required reading for the C.L.S.C. class of 1881-82) snuggled between weightier academic tomes shown here. I hunted for, and found the impossibly dense (reportedly dry, according to more than one The Hall in the Grove character!) 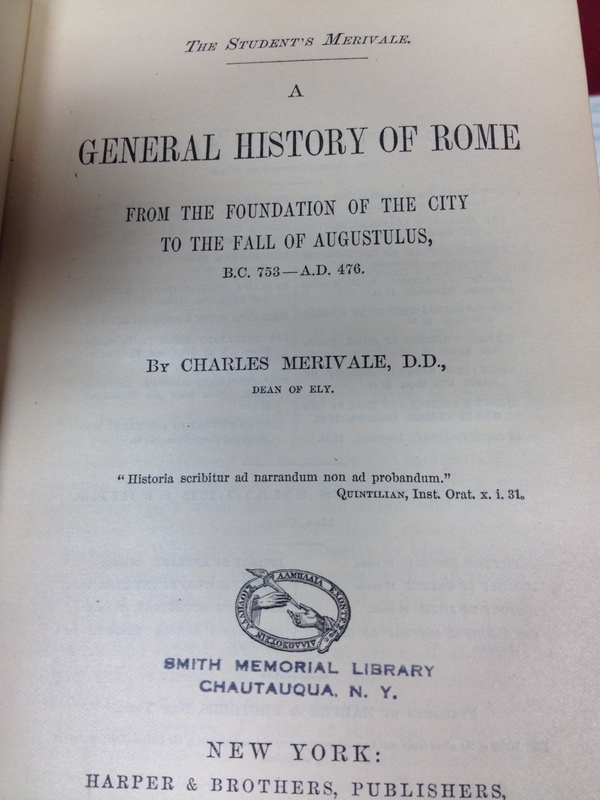 Merivale’s History of Rome … one brief dip into it made me admire “Paul Adams,” “James Ward,” and “‘Pick ‘Em Up’ Caroline Raynor” all the more for virtually memorizing its contents. I learned from the very helpful, very gentlemanly guardian of these treasures that one can indeed become a member of C.L.S.C. without having to limit oneself to the current crop of books! He assured me that I could “graduate” with a future Chautauqua class by reading a specified number of ANY C.L.S.C. materials, from any year! Karen’s next Postcard from Chautauqua will feature The Hall of Christ and the Hall in the Grove. ← Let’s Hit the Beach! How interesting! Chataqua is virtually forgotten in social culture and you’re going to show us the real places! !